The day started icy, with the temperature dropping to -5 the night before. Therefore the track was wet after it eventually defrosted. Just as I was about to leave the grid for the qualifying session, we noticed that the front left tyre had gone flat. With no time to change it; I just had to do my best with it. Fortunately I hooked up a quick lap and with the other tyres pressures being so low anyway due to the conditions; I managed to stick on 2nd. A dry line emerged on parts of the track for the pre-final, and half the grid opted for slicks, whilst we remained on wets. It was a good call and I managed to get my head down and get myself into the lead. I had a lot of pressure from Tom Truscott behind me, however I managed to hold him off until the flag. The final had almost identical conditions to the pre-final; so we remained on wets. Starting from pole gave me the upper hand into the first corner, and I kept my lead by the end of the first lap. I knew I couldn’t lose the lead and had to fight off the pressure from behind me in the early stages. By mid-race I was beginning to build a gap, which I managed to hold to take victory. Winning the GP Plate meant a lot, as it was my first nationally recognised title; this means that for 2009 I will run the letters GP instead of a number. 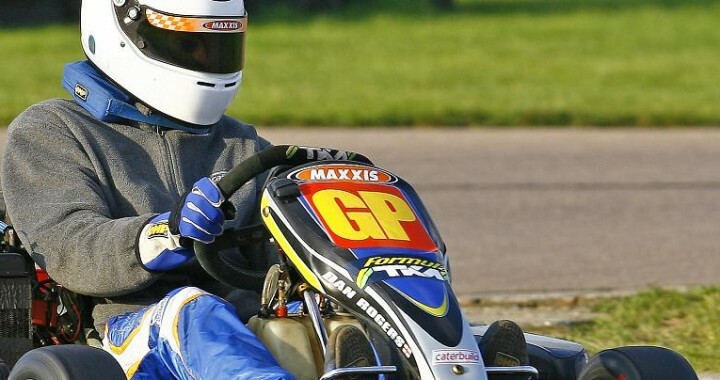 I am the first ever winner of the Kartmasters Event in Senior TKM 4 Stoke, and the win also meant I got £100 prize money, along with the two biggest trophies so far! Posted in Updates and tagged PF International.